Mahalo to the HIC Surf Ohana! 27 April, 2016 – Kailua, Hawaii – This past Saturday, over 125 of Hawaii’s keiki took to the surf at Kailua’s Kalama Beach during the 15th Annual Ocean Sports and Fitness Day. HIC and Volcom once again partnered with the Outrigger Duke Kahanamoku Foundation (ODKF) and the Boys & Girls Club of Hawaii (BGCH) to give Hawaii youth the opportunity to learn to surf, bodyboard, paddle canoe and play volleyball. All in the spirit of Duke Kahanamoku. The Ocean Sports and Fitness Day provides a unique opportunity for BGCH members to spend a day learning beach and ocean sports, health, fitness and ocean safety. The participating keiki come from five Boys & Girls Club of Hawaii locations around Oahu, including Waianae, Nanakuli, Ewa Beach, Honolulu and Windward Oahu. For many of the keiki this was their first opportunity to learn to surf, even though they have grown up in the birthplace of the sport. Surfing instruction was provided on the beach by Tammy Moniz of Faith Surf School, while bodyboarding class was lead by Jeannie Chesser. 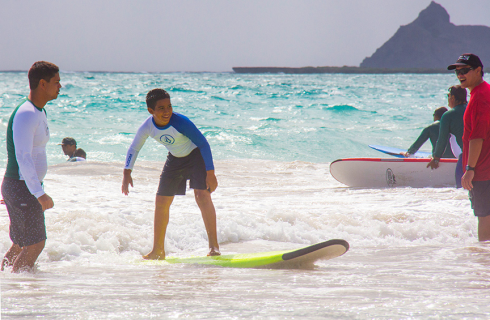 Each child is paired with a volunteer instructor, a soft surfboard or bodyboard, and then hits the waves. The list of instructors included local pros like HIC’s Josh Moniz, as well as Kaimana Henry, Kai Garcia, Tai Van Dyke, Kawai Lindo and Jason Shibata from Volcom. Thanks to a grant from the ODKF this event is free for BGCH members. A very special mahalo to all of the volunteers in the water and on the beach who generously shared their time, knowledge, stoke and aloha with Hawaii’s next generation of waterman. Mahalo to Na Kama Kai, Kailua Sailboards and Kayaks, Kevin Wong, Vern Podlewski and Duke’s Waikiki for supplying lunch for all of the kids and volunteers. Aloha! Hawaii’s biggest and best selection of surf gear – since 1971 HIC has provided Hawaii with quality surfboards, skateboards, clothing and accessories – by surfers, for surfers. Locally owned and operated, the HIC retail chain includes fourteen stores across Oahu, Maui and the Big Island, plus two in Japan. Through a commitment to quality, service and aloha spirit, the brand has built a reputation as an icon of Hawaiian surfing recognized throughout the world. Enjoy the ride! Boys & Girls of Hawaii (BGCH) is a non- profit organization dedicated to inspiring Hawaii’s youth to become responsible citizens. BGCH currently operates seven clubhouses on Oahu and Kauai, where BGCH members can access a multitude of programs and series. BGCH’s Clubhouses and outreach sites provide high impact character development programs for children 7-17 years old. Key programs emphasize character and leadership development; career and education development; health and life skills; sports, fitness & recreation; and the arts. Annual membership is affordable so that every child can participate.